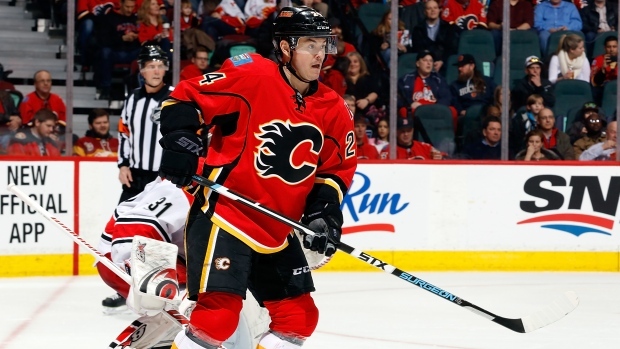 CALGARY - For a number of reasons including big raises owed this summer to his two linemates, the Flames dealt impending unrestricted free agent Jiri Hudler to the Florida Panthers on Saturday. In return for the 32-year-old winger, the Flames received a second round pick in the 2016 NHL Draft and a fourth-rounder in 2018. "Jiri's a very good player but in a cap system, you have to make decisions," said Flames general manager Brad Treliving, before Calgary's game against Ottawa. "The reality of the contract situation we have here now and the contracts we have upcoming, uncertainty with where the cap number is going to be, whether it's reality that we'd be able to get Jiri back here. That all played into it." Hudler has 10 goals and 25 assists in 53 games this season but his production is down from a year ago when he tied for eighth in league scoring with a career-best 76 points (31 goals, 45 assists). He also led the NHL in even-strength points (60) and won the Lady Byng Memorial Trophy as the league's most gentlemanly player last year. He has a total of 155 goals and 251 assists in 657 career games with the Detroit Red Wings and the Flames. Hampered by a groin injury early in the season, Hudler has been back in form lately with 13 points in his last 15 games, skating on the right side of the Flames top line with Johnny Gaudreau and Sean Monahan. That trio was one of the most dangerous lines in the league last season and were a big reason why Calgary surprised many by making the playoffs for the first time in six years. "I have mixed feelings," said Hudler. "I knew it was coming and I tried to prepare myself for it but I don't think there's a thing you can do. You think about the good times you had with the team in Calgary, especially last year and the run we had." Treliving said Hudler was a big influence on his two young linemates. "He's a skilled player and that skill level helped drive them but he was also talking to them all the time," said Treliving. "Jiri's a real competitive guy. Many times you get to the bench, he'd let you know if he didn't think things were good enough." After reaching the second round in the Stanley Cup playoffs, this year has been a disappointment for Calgary. They are 28th overall, just five points up on the last place Edmonton Oilers. Calgary has a young, talented foundation in forwards Gaudreau (22), Monahan (21) and Sam Bennett (19) and defencemen TJ Brodie (25) and Dougie Hamilton (22). Treliving said picking up a second round pick was "great currency" as he continues to build his team for the future. It is the second trade of the week for Treliving, who shipped Markus Granlund to the Vancouver Canucks on Monday in exchange for 2013 first round pick Hunter Shinkaruk. There could be more deals to come too. Defenceman Kris Russell, also a unrestricted free agent, is considered one of the top rentals on the market. Hudler joins a club that leads the Atlantic Division and is second in the Eastern Conference behind the Washington Capitals. Florida has made the playoffs just once in the last 14 seasons. The Czech will join his countryman Jaromir Jagr. "We are very pleased to welcome Jiri to the Panthers," said Florida general manager Dale Tallon. "He is a highly skilled and experienced player that adds leadership, character and offensive ability to our team." Hudler's 77 playoff games includes back-to-back trips to the Stanley Cup final with Detroit. The Red Wings defeated Pittsburgh to win the Cup in 2008. They lost to the Penguins in a repeat showdown in 2009. Drafted by Detroit in the second round in 2002, Hudler played parts of six seasons with the Red Wings before signing with the Flames as a free agent in 2012.